This is a story about an entrepreneur who quit a stable, well-paying job and risked her life savings to pursue a passion. This is a story of an engineer using skills she acquired at Stanford University to create something new. And this is a story of a businesswoman who leveraged non-traditional funding sources, most notably Kickstarter, to raise the capital needed to launch a company. Meet Debbie Sterling, founder of GoldieBlox, a Bay Area startup launched in 2012 to create toys that inspire girls to pursue engineering. Ms. Sterling generated nationwide media attention, from Time Magazine to Wired to Forbes, after raising over $285,000 on Kickstarter to fund GoldieBlox. There are more women than men in our country, yet according to the National Science Foundation barely 15% of engineering degrees are awarded to women. There are exceptions, including renowned Harvey Mudd College, where women are approaching an equal split of graduates, yet despite years of effort, the number of women seeking engineering degrees remains stubbornly low. Debbie Sterling is on a social mission to change those statistics by introducing a generation of girls to engineering. 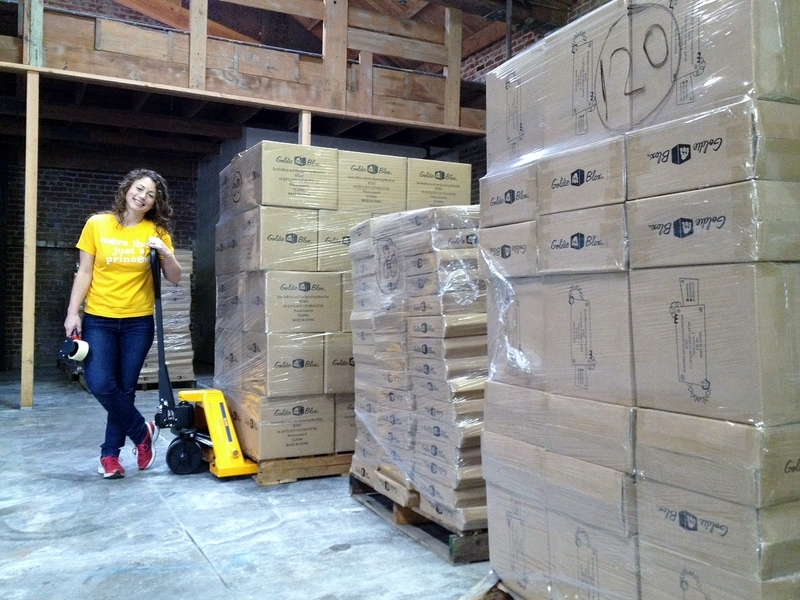 OneDublin.org recently spoke with Ms. Sterling about women in engineering, entrepreneurship and founding her company, GoldieBlox. James Morehead: You recently spoke with middle school girls at the Expanding Your Horizons Science, Technology, Engineering and Math (STEM) event held at UC Berkeley. What message were you trying to convey? Debbie Sterling: “The reason why I started GoldieBlox in the first place was because I am passionate about getting more girls and women into engineering. As I began researching the problem I identified that you have to hook girls when they are really young. As early as age four girls start identifying certain gender roles in occupations. The first toy that I’ve launched, which I hope will eventually be a huge brand covering a bunch of different ages, was designed for girls aged five through nine. Morehead: What was your spark to pursue engineering and apply to Stanford University? Sterling: “There is one reason for it. I asked my math teacher in high school, she was one of my favorite teachers, to write my recommendation letter for Stanford. She asked what I was planning to major in so she could talk about it in the letter and I told her that I didn’t know. She asked if I’d thought about engineering and it threw me off because I thought engineering was a weird thing to suggest. I remember being embarrassed because I didn’t know what engineering was, I thought maybe it was a train driver [laughs], but I was too embarrassed to ask her so I just smiled and shrugged my shoulders. I forgot about that conversation until my freshman year in college when I still hadn’t decided what to major in, and her voice stuck in my head. Morehead: As you noted, a lot of people don’t get what engineering is really about. 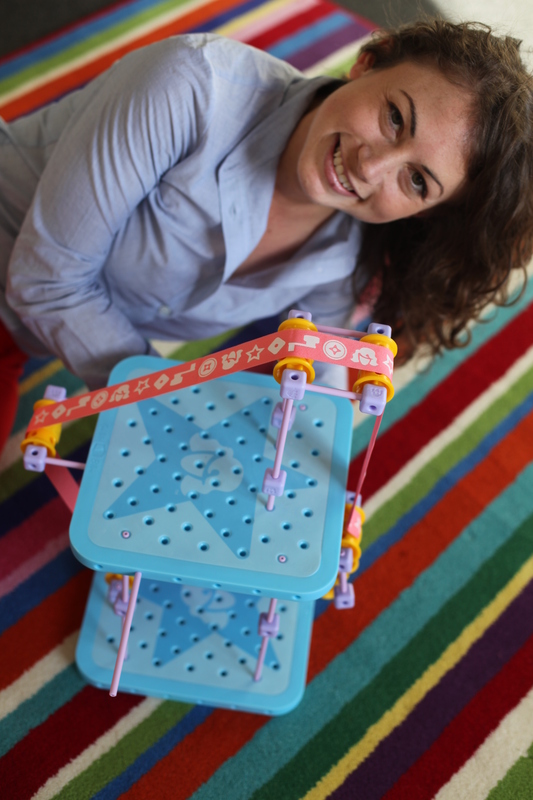 How has what you learned in college about engineering helped you in making GoldieBlox a reality? Morehead: You took a significant risk leaving a stable, well-paying job to invest your life-savings into starting GoldieBlox. How did you plan that leap into the unknown? Sterling: “I remember the very moment when I had the idea for GoldieBlox. I was hanging out with a group of friends and we had a tradition called ‘Idea Brunch’ where we got together, made breakfast, and shared our latest ideas for an invention or project. In one of the sessions a girl friend who also studied mechanical engineering with me at Stanford mentioned LEGO for girls, because there aren’t enough female engineers. She said she’d played with her brother’s LEGO sets and that it helped her get interested in Engineering. The moment she said that it was like a lightening bolt for me. It was an epiphany moment: I knew I had discovered what I wanted to do with my life. Ever since that moment I become really obsessed with the idea: it’s all I thought about, all I talked about, all I wanted to do. “I had a full-time job and started saving, knowing that eventually I was going to leave that job and create an engineering toy for girls, that it was my life’s calling. I created a plan for how to accomplish my dream: I drew a deadline on the calendar – ‘I will quit my job by this date.’ I decided to give the idea one year and made sure I had enough savings in my bank account so that I could go one year without making any money and wouldn’t be destitute. If by the end of one year nothing took off, if I couldn’t come up with a solution, if there was no traction, I could always go get another job. Morehead: In college I found engineering to be a very practical discipline, that at its core really teaches you how to solve problems. I was also told once that great ideas are a dime a dozen, that it’s how to execute on those ideas that makes the difference. Tell me about some of the unexpected, tough problems you solved to make GoldieBlox a reality. Sterling: “I had created a working prototype using a peg board, thread spools and wooden dowels. It worked and it’s what I used to test the toy with hundreds of kids, and they really liked it. I was confident that I had a great idea and now had to turn the prototype into a real toy. I worked with an industrial designer to spec the toy and put it into a CAD system, and then worked with a factory to create a beautiful prototype. The real challenge is how you create parts that can be mass-produced, using injection-molded plastic. That step required very advanced engineering, far beyond what I had ever studied in school. In designing a mold for plastic parts you have to ensure that the plastic flows through evenly and in just the right way, and when the plastic cools it must set in a certain way. “It’s not that hard to create a simple, one-piece toy, but I was creating a construction toy that requires perfect tolerances. The pieces must fit together perfectly, meaning the holes have to be accurate to 0.0001 mm; if you are off by just a tiny amount and have to make a change it takes the factory two weeks to adjust. On the GoldieBlox pegboard, the holes will cool at different rates which adds additional challenges in getting it just right. To make a long story short it is really hard to make a construction toy! There is a reason why LEGO is a category leader because they’ve had many years to perfect that little brick. That little LEGO brick is a piece of engineering genius. Morehead: With your first GoldieBlox shipments, and all the attention you’ve received as a result of your successful Kickstarter project, you are at a tipping point where GoldieBlox is starting to become a real company. What new challenges you are facing? Sterling: “I think we have an awesome business opportunity. Our two main competitors are LEGO Friends and MEGA BLOKS Barbie. What they’re showing is that construction toys for girls is a real category, which wasn’t the case two years ago. They are paving the way, but at the same time they have the same approach which is very traditional, gender-stereotypic: beauty parlor, pony stable stuff. GoldieBlox really stands out next to them which I think is great. We have a unique offering. If a girl likes playing with LEGO Friends we believe her parents will want her to have GoldieBlox too. 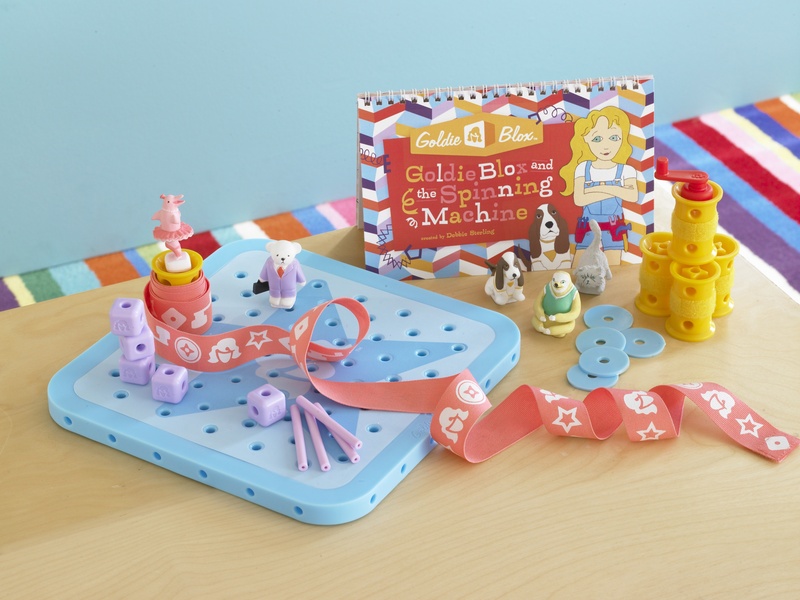 And if LEGO Friends is too girly for their daughter, then GoldieBlox is perfect. I believe we have an attractive, unique, differentiated product to offer. “I do believe that society is shifting away from ‘princess’ and that we’re just starting to see a princess backlash; I’m also seeing a lot of backlash against boy vs. girl toys, and a move towards gender neutral toys and gender-bending toys. We were just mentioned in Time Magazine so I feel like we’re making history. I think we’re on the crest of the wave. Morehead: Kickstarter has had several highly visible success stories, and yours is one of them. What was your experience leveraging Kickstarter to raise money for your idea? Sterling: “I decided to use Kickstarter as a vehicle because I had already raised a friends and family ‘C’ round which enabled me to incorporate and start building some intellectual property. I wanted to find out if anyone but my parents thought that GoldieBlox was a good idea so Kickstarter was a way to put the idea of GoldieBlox out to the world and get feedback. I also wanted to know if a $30 price point was something people were willing to pay, and to see if this construction toy for girls was something people wanted. The alternate route, which is what young, fledgling toy companies had to do before Kickstarter, was to fund a minimum production run, go to Toy Fair and hope that stores would want to carry the product. Morehead: So the people funding GoldieBlox through Kickstarter were also your first customers. Morehead: With all the coverage and attention GoldieBlox has generated, and the nature of Silicon Valley, have you attracted a lot of interest from investors? Morehead: Do you have plans to take the GoldieBlox concept and create a smartphone or tablet app? Morehead: What advice do you have for parents, students and educators? Sterling: “I recommend boys and girls take at least one engineering course in their freshman year of college – I think it should be a requirement – because you never know. I think everyone should give engineering a try. Engineering gets a bad rap; I hated the idea of engineering until I actually tried it. If students can try engineering earlier they should, if those options are available. Since STEM has become such a huge initiative for the Obama administration there have been more after school programs, which provides great opportunities. “I think we should change the word ‘engineering’ because it sounds so overly technical, boring and intimidating, something that is only for geniuses, and that just isn’t true. What engineering really teaches you is how to make stuff. You acquire the skills to invent anything. Engineering is probably one of the most empowering skill sets and I can’t think of anything more meaningful than taking an idea and making it real. Whether that is a computer program, or an app, or a website, or a toy, or solar panels, or whatever, engineers make all the things that we use in our everyday lives, the things that are advancing society, and that are making our world a better place. Engineering is an incredibly rewarding career path and it is also a lucrative career path – engineers make more money than other fields. “Engineering is also an exciting, fun and creative career path. When I first heard of engineering I thought it was only math and science, and that didn’t appeal to me because I’m incredibly creative. I love writing and the Arts, so I thought if I ended up doing engineering that I would have to ignore my creative side, but that’s entirely untrue. Engineering is incredibly creative, and we need more creative engineers. We need engineers who understand people, because when you are building things, you are building things for people. I know that a lot of girls are incredibly intuitive, and social, and love being around people and understanding their needs, and I believe engineers that can do that are better engineers.